Some of you may have already seen my (overly) passionate arguments in Discord over what should be done about EXD damage, specifically H_Launcher and L_ACannon, as well as my suggestions for the current AOE system. I also wanted to talk about a potential mechanic for players that are downed in combat, the question I have being: what happens to them when they're hit by other damage after being downed? I figured the forums were a much slower paced, easier to read place for this kind of debate, so I brought it over here, because I think there is a desperate need for discourse over a lot of the current game mechanics. I'm not discussing this stuff for my personal gain, I'm doing it because I care for this sim as it's a rather large portion of my free-time nowadays, and I want to see everyone I RP with have fun. I would really like to hear everybody's thoughts to see what the standpoint on a lot of these, well, what I see to be as issues, are. A player with 6EXD using an H_Launcher can use their 1d20 roll, potentially dealing 24 + 6 on a hit, or 12 + 6 damage on a miss (I'm not including DR), all within a 10m AOE radius that can be placed anywhere on the ground. This, coupled with movement action reloads and extended magazines give players the opportunity to dish out this damage every single turn. The 12 + 6 damage on miss is unavoidable without [cover], and while I've personally found [cover] to be an impressively strong mechanic through abilities such as Bulwark, it is not often that players have builds revolving around it. If not directly placing the AOE center on a target, and attacking the ground instead, reduce the damage. For example, H_Launcher base 24 dmg -> 20 damage. Tone down the half-damage on miss element. Perhaps +6 to a miss is a bit too much. Remove the ability to use extended magazines on an H_Launcher. As it stands currently, a player may cast any attack that spawns an AOE wherever they want on the map within range, and do not have the requirement of targeting a player that other weapons and abilities have. Meteor, many Dark Magika abilities, and several other AOE abilities that aren't coming to mind all play by these rules, but most importantly, EXD damage does too. 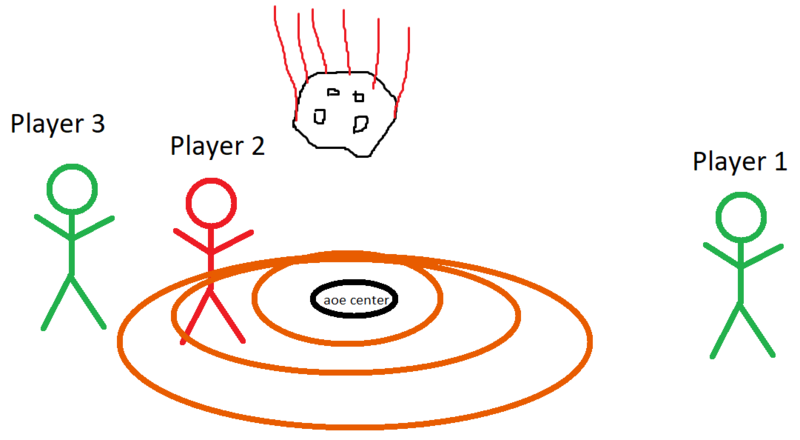 In this case, Player 1 is casting Meteor and placing the center of the circle away from directly hitting the target, Player 2, in order to not hit their ally, Player 3, who is in very close range to Player 2. Some ballistic weapons as I've been told are apparently held by different standards. As I understand it now, (and this may have been changed) 'Firing into a Melee' has the potential to harm your allies if they are within a certain range of an enemy target. I think I remember this being a bigger deal in 8th edition, and am unsure if this is still the case. But, I asked myself: why shouldn't AOE damage be held to the same standard? Not only do I see it as kind of ridiculous that people get to place their AOE markers with impeccable precision, when an explosion would likely cause shrapnel to harm an ally that close, but it's also rather unrealistic, even by RoE standards. AOE centers MUST be centered on a direct target, or at least stem from one. More on this in a moment. AOE abilities that deal damage can have a double-layered AOE: An inside ring that deals max damage on hit, half-damage on miss, and an outside ring that deals half-damage on hit, no damage on miss. This would fix the 'not hitting allies because I am a master at 4D chess' shtick, as the allies that are in close range of a target would still have the potential of at least taking half-damage from shrapnel. Let's be real, explosions aren't exactly the most contained element, and if I were a hostage I would not want some dude firing a rocket at the guy grappling me. A damage penalty may be applied if not firing directly at a target. For example, as mentioned previously, H_Launcher 24 -> 20, or perhaps even less, if not firing directly at someone. 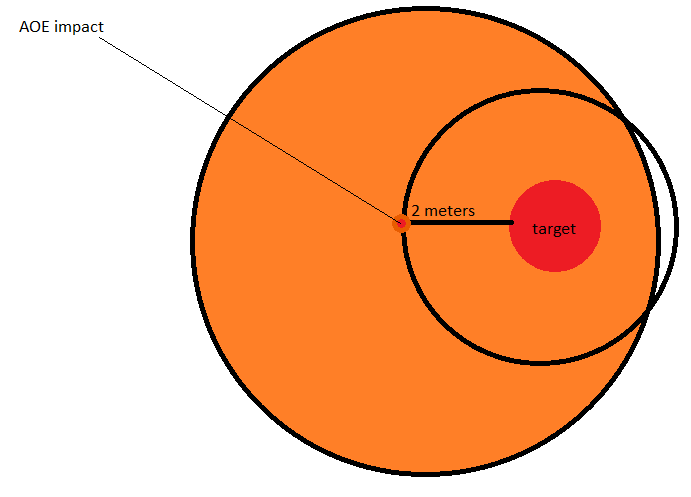 An accuracy penalty whenever an AOE is placed on the ground, and not directly on a target. For example, -3 ACC to your rolls when attacking people with an AOE and not targeting them directly. Now obviously, all these 'fixes' don't attack the same exact issue, but they are a way to at least tone down AOE. Direct targets is the core problem, and there are several solutions, I feel. As shown, while a main target is still required, the actual explosion may be placed, let's say, two meters off of the target, in order to give a bit of wiggle room for someone who wishes to hit multiple targets at once. Hitting multiple targets is the core strength of AOE, and it would be silly to hinder this strength, so I believe this could be a neat, not overly-complicated fix. I probably left out a lot, but that's all I have to say for now on AOE circles. This is more of a side idea that I had recently after an encounter, and it is not mentioned in the rulebook, so I thought I'd say a little bit here. A recent combat scenario involved someone grabbing a downed player and moving them out of harm's way. Later on though, an AOE found their way onto the downed player, who had negative hitpoints. Technically, when you are downed in combat, you do not take a wound until the end of combat because of the possibility of resuscitation. However, it isn't clearly stated whether or not a player may also take additional damage past 0HP, even when they are downed, and whether or not a player may be mortal wounded/executed mid-combat. A player who is downed in combat is still able to be hit by attacks and may not dodge them. These attacks are considered execution with intent to mortal wound, just as victors have the opportunity to mortal wound a downed enemy at the end of combat. However, a player must be hit two times, or reach a certain amount of negative damage, to be considered for mortal wounding. A player who is downed in combat, and still takes AOE damage or any other sort of focused damage, and has their HP reduced past 30 (or 35, or 40, or 45. That can be decided upon by people smarter than I), will be forced to take, or at least roll for, a mortal wound. I do think that if a player can be resuscitated, they should just as equally have the chance to be hurt even more. Combat isn't over, and just because they are out of the fight doesn't mean their body is. The body is still in harms way, and players may go out of their way to carry a downed player to safety. This makes a cool RP element, I feel, and also gives healers a pressing urgency to revive downed players. I care for this sim greatly and want to see every aspect of it strive, especially combat. I hope any of these ideas sparked something within you, the reader, and I hope to receive much criticism and hear other suggestions about things I've brought up here. Thanks! One point I do greatly agree with... is if it hits one person in a grapple... it hits both.